The presented room availability, rates and discounts are actual and final for all our 479 hotels in Cannes. Cinquanta Caffe is considered one of the best Italian restaurants of the city, so there’s no wonder why its menu contains various popular dishes. The restaurant has its own wine cellar, so it won’t be difficult to find a quality drink for every meal. 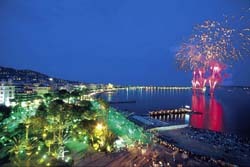 Le Farfalla pub is located not far away from Palais des Festivals. The restaurant has won respect and devotion of both local residents and tourists. This dining facility is a great place to try best sorts of German, Czech and Dutch beer. The choice of signature dishes is truly huge. By the way, visitors can get a portion of snacks absolutely free of charge just by ordering a glass of beer. French restaurant Le Brouette Des Artisans is distinguished not only by a rich variety of dishes, but also by original design of the interior. This is a great place for all kinds of celebrations. Thanks to very attentive staff and delicious food any banquet will be held here at the highest level. The design of La Cave restaurant resembles a classic Parisian bistro. This is the place where visitors will always find calm and relaxed atmosphere. Every day guests of the restaurant are provided with an original menu that contains many popular national dishes. La Cave also has a great wine bar, the choice of drinks in which will surprise even true connoisseurs of French wines. The hall of A La Maree restaurant is decorated in the style of past centuries. Here visitors will see old paintings and antique furniture. The restaurant is very popular among fans of gourmet cuisine. A La Maree serves many delicacies, but its frequent customers usually recommend fried quail with a particular grape cream, stew in a pot and chicken stewed in beer sauce.